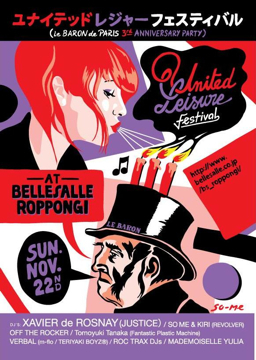 I want to tell you about this event my friends at Le Baron are producing – coming up in Tokyo Sunday 2009.11.22 (Monday is a holiday) I’m not spinning as DJ at this event – but I’m sure I’ll spinning on the dancefloor..
United Leisure, the company behind leading Tokyo clubs Le Baron de Paris and Velours, as well as top Osaka nightspot Live & Bar 11, is proud to announce a major event held in celebration of the third anniversary of Le Baron de Paris. the Tokyo party scene, making this the biggest club event of 2009.
kind of special night that only Le Baron de Paris can put together. populated by our regular celebrity attendees. Le Baron de Parisâ€™ third anniversary will be an event on a truly grand scale. With an amazing cast and plenty of surprises in store, the full details will remain a secret until the end of October. Until then, prepare yourselves for one of the biggest nights Tokyo has ever seen! This entry was posted on Tuesday, November 3rd, 2009 at 9:50 pm and is filed under Tokyo Direct. You can follow any responses to this entry through the RSS 2.0 feed. You can leave a response, or trackback from your own site.